Local Review: Denney Fuller and His Elaborate Elves – It’s Christmas Again?! 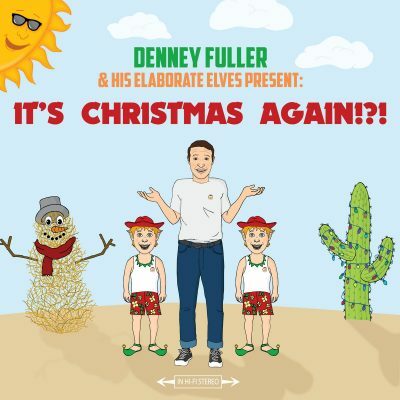 Local composer and producer Denney Fuller is just saying what everyone is thinking: It’s Christmas Again?! Fuller released his second Christmas album, a seven-track set packed full of a variety of instruments, creating a nuanced and nostalgic approach to Christmas music—sometimes polka, sometimes jazzy, sometimes mystic. Together, Fuller and his elaborate elves, Beaux Underwood, Allison King and Parker Childs from St. Boheme, layer sounds from the trumpet, glockenspiel, ukulele, euphonium, acoustic guitar, electric guitar, electric bass, organ, recorder, xylophone, vibraphone, melodica, wooden/indian flute, clarinet, sleigh bells, tambourine, various percussive instruments, music box and even a Burger King toy. The album is a combination of original tracks and Fuller’s renditions of original Christmas songs. It’s Christmas Again begins with a short, 47-second track titled “Danny, The Elf,” which winds up at the beginning, like a toy, and plays a scratchy, high-pitched lullaby, devoid of lyrics. The majority of the tracks are devoid of lyrics, but they effortlessly create a mood, letting the music do the talking, especially on tracks like “Shhh!… It’s Snowing,” which is the perfect song to accompany the image of snowfall.